Join us at 7pm in the Higher Education Building of CDU for our next meeting. Additional information can be found in the current newsletter. 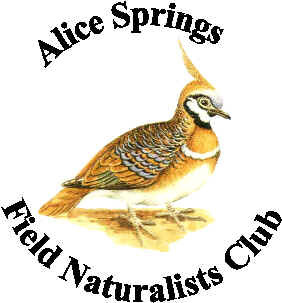 Regular monthly meetings are held, with a guest speaker talking about some aspect of natural history. These are often illustrated with computer images or slides. Meetings are held on the second Wednesday of each month (except December and January) at 7:00 pm at the Higher Education Building, Charles Darwin University. Visitors are welcome. The frequent field trips are usually organised at weekends, longer ones in the Winter months, shorter ones in the heat of Summer. These include bushwalks of varying grades, drives to interesting locations and nocturnal wildlife spotting. They may be day trips or over several days and include camping. There is always plenty of time for observations, identifications, discussions and photographs. Browse our newsletters to see photos and descriptions of our past excursions. Projects include Water for Life monitoring of local waterholes, fish, plant and animal surveys, and participation in the ongoing Australian Bird Atlas. A monthly newsletter is sent to all members with information on meetings, trips and activities, and any other articles of interest submitted by members. Details about upcoming trips and speakers can be found in the current newsletter. Desert SNAILS living around Alice Springs.